Pale Waves Release Lively New Single "Kiss"
English goth-pop band Pale Waves released “Kiss” on Wednesday. The single is the band’s first preview of their forthcoming debut album, due out later this summer. On “Kiss,” the Manchester-based band’s glittery dream-pop hooks are offset by frontwoman Heather Baron-Gracie’s melancholy and brooding lyrics underneath the surface: “Why most nights do you wanna live inside my head?” she sings, and later, “You smelled smoke / We don’t know where heaven is.” Baron-Gracie describes her lover as a wave about to break, and there’s a sense of the inevitable end buried beneath the lively pop beats on the track. Pale Waves formed in 2014 and developed a cult following in Manchester. 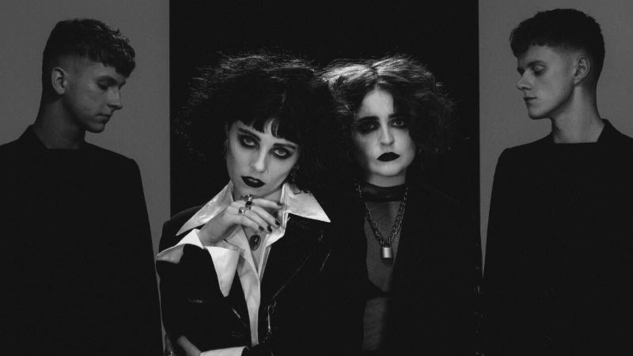 After being signed to indie record label Dirty Hit, they eventually caught the attention of The 1975’s Matt Healy and George Daniel, who would go on to produce Pale Waves’ first single “There’s a Honey.” In February 2018, Pale Waves released their first EP All the Things I Never Said, which received positive reviews. The band’s first full-length album is due out in mid-2018. Pale Waves is scheduled to perform at Lollapalooza and Outside Lands this summer, as well as many other festivals. Listen to “Kiss” and find Pale Waves’ upcoming tour dates below. Stream the band’s other available music here.